During a recent visit to the Lake District to climb Scafell Pike with my eldest son Josh; we were fortunate enough to be out on one of those perfect spring days that we’ve seen precious little of lately. 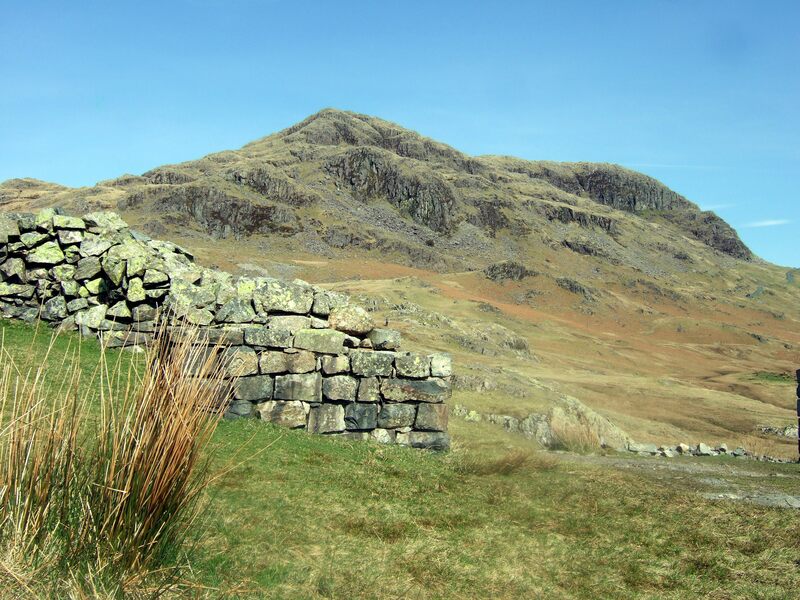 The day before we headed off to the Pike we investigated The Roman fort at Hard Knott in the region’s quieter south western corner along with Britain’s most severe road pass and a remote summit that was a first for us both. Setting out from the Eskdale valley in warm sunshine we followed the road towards Hard Knott Pass, soon leaving it to follow a path on its left that cut off some of the twisting hairpin bends. Every so often a car would descend amid the smell of burning brake pads while our path soon veered off and climbed some boggy ground to the gap in the solid stone wall above that used to be the main gate of Mediobogdum – the Roman Fort of Hard Knott. 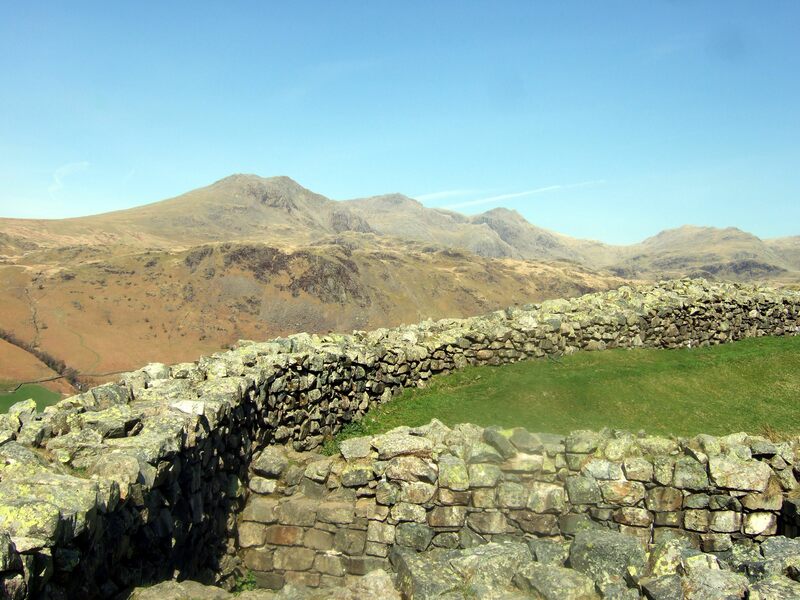 The fort which was built in the second century during the reign of Emperor Hadrian of wall building fame, occupies a commanding position high above Eskdale with fine views down-valley to the Irish Sea and up to the wild and rugged Scafell Range. The last time I was here – also at Easter – a sleet laden wind gusted around the ancient stones and snow topped the mountains in the North but today couldn’t have been different. Still I wonder whether the Roman soldiers patrolling here felt privileged to see this wild and remote corner of the Empire or just saw it as a cold inhospitable place populated by enemies. Probably the latter though it is one of my favorite places in the Lakes. The view up-valley incidentally will not have changed since they used to patrol these walls. Leaving Mediobogdum by its eastern gateway we followed a wide grassy and occasionally damp path towards the impregnable looking peak of Hard Knott to the East. The path narrowed and passed beneath gaunt crags that rose steeply on our left. 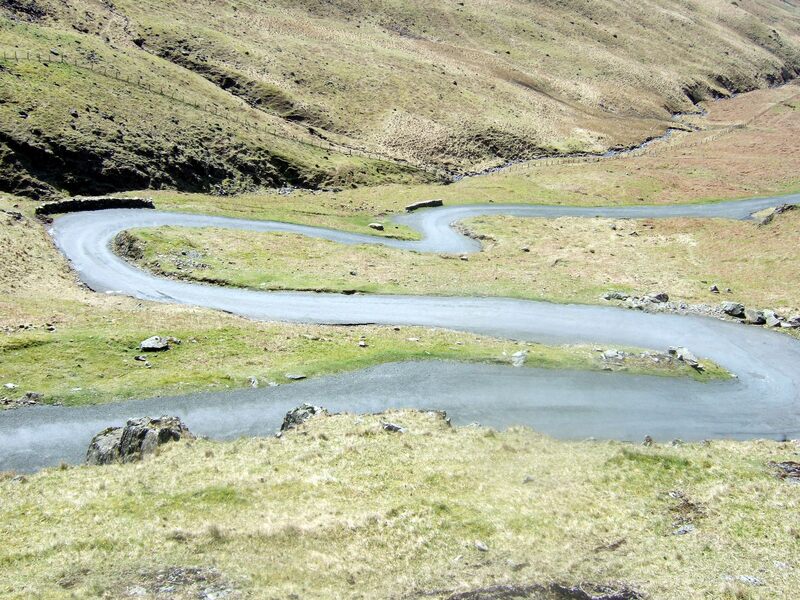 Below and to the right was the road crossing Hard Knott Pass which with grades of 30% in places is one of Britain’s severest roads. 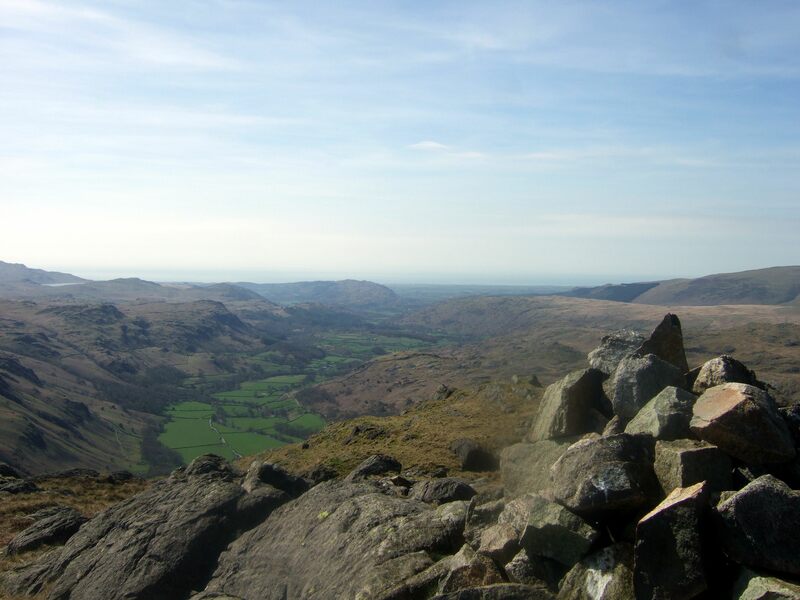 The summit is marked by a cairn and views of the “back” of the Coniston Fells and the lonely valley of the Upper Duddon. Up to the left and a faint path led us between rocky knolls and up behind the wall of crags we had walked beneath to the summit ridge of Hard Knott – another of those modest but impressive peaks that are always worth climbing – where we sat for a while in the sun by the cairn on Border End overlooking Eskdale; the only people in sight. 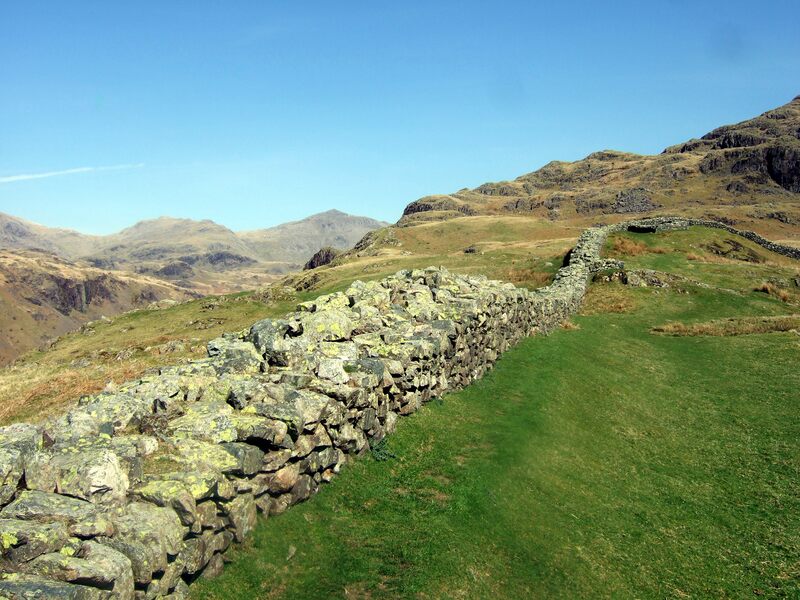 The Roman Fort is at an altitude of just over 800 feet or 250m and is a short but steep uphill walk from the bottom of Hard Knott Pass. There is limited parking where the road passes just below the fort and also at the top of the pass where you van walk down the path we ascended. There are larger areas along the road in the valley and we set off from just after the bridge a kilometre or so east of the Youth Hostel. Please note that the road is narrow and very steep and is totally unsuitable for caravans, trailers or larger motorhomes. The road summit is at about 1290 feet. If you walk up to the summit cairn – worth it for the view – it makes for a round trip of about 4 miles/6km from the bottom of the pass. The cairn is about 500 feet above the road summit. In case anyone wonders how we got on the next day’s trip to Scafell Pike, it’s on my Lake District walks page. This entry was posted in Lake District and tagged Britain, Cumbria, history, lake district, lakeland fells, landscapes, nature, outdoors, photography, photos, random, romans, travel, walking, writing. Bookmark the permalink. That must have be a tiring hike, but so rewarding! Love the snaps. Wish I could go someplace like this on the weekends. Thanks – we were lucky to get the weather like that – usually you can’t see so much! Such beautiful scenery. Would love to visit… though I don’t like hiking! The fort itself isn’t so far from the road – just looks it! Wonderful scenery, Pete- I picked up ‘The Colonel of Krasnoyarsk’ for my Kindle, it’s on my long reading list! 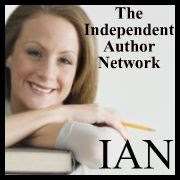 Thanks and hope you enjoy the story!